Looking for a fun way to make your business stand out? Custom printing may be the answer. Picture plumbers’ business cards that look like faucets, circular pamphlets, or curved door hangars — any type of marketing material different from the norm. Using a bit of creativity will help your business gain attention. You can let your imagination run wild with our many options for custom printing. Consider your business and its purpose. Then think about your logo, company colors, and the designs you favor. You can draw on these things to come up with eye-catching ideas that will make a lasting impression on anyone who receives them. For instance, a restaurant might hand out menus shaped like a signature dish. This instantly conveys the purpose of the material and engages anyone who might receive it. Whatever shape you have in mind, run it past us. We love trying new and unexpected things with our customers. We can go well beyond different shapes. How about a black-and-white custom order that draws attention because it’s so different? Or what about a new logo? We can create a new logo for your company that takes into account your corporate identity and culture. Having the right logo can help define you for years to come. Many businesses have discovered the utility of having a recognizable symbol that instantly calls to mind their dependability and trustworthiness. Of course, the number one reason for using remarkable marketing materials is this — they really get people talking. Why do something everyone else does when you could stand out for going against the grain? Think of every marketing opportunity as a chance to do something new, and feel confident that we can rise to the task as your promotional partner. You can even swing by our facility in Irvine, CA, to see examples of past ideas we have worked on for clients — they may just inspire you. Establish your unique calling card. 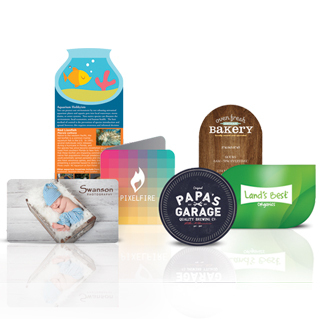 Get in touch with us today to discuss your custom-order promotional and marketing materials. Request A Quote For Custom Orders Today!